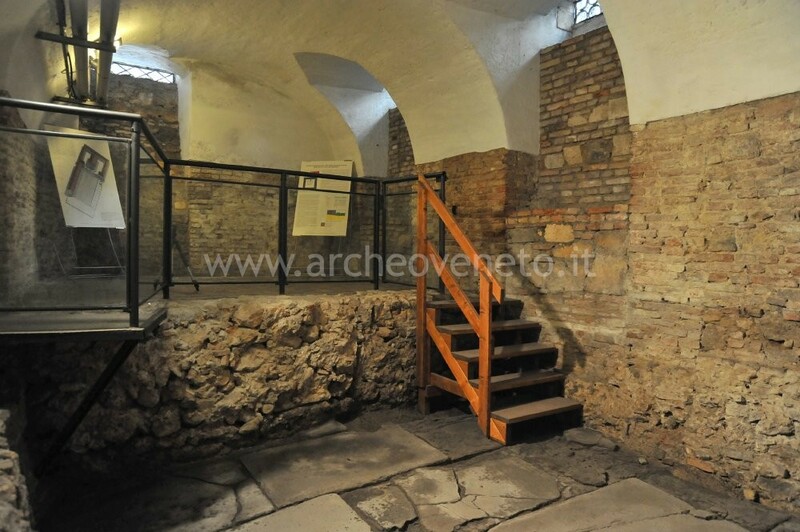 The archaeological area of the palace “Palazzo Trissino” displays the remains of the Roman forum of Vicenza (end of the I century B.C. – I century A.D.) and of a Roman tower dated to the XI-XII century. The archaeological excavations were carried out by the General Direction for Archaeological Heritage in the Veneto region in 1989. Vicenza is located in the west-central plains of Veneto, at an average altitude of 40 metres above sea level. The city is surrounded by the Berici hills on the south and by the south-eastern margins of the Lessinian mountains of the west/northwest. This archaeological area is located in the heart of the modern and Roman city. 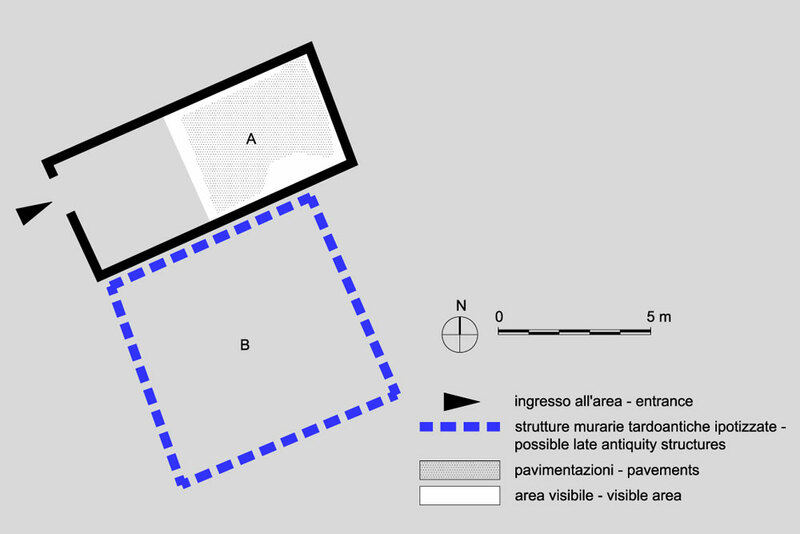 Roman forum at "Palazzo Trissino"
The researches that have been carried out at the palace “Palazzo Trissino” allowed to discover a piece of pavement (A) which has been interpreted as that of the Roman forum on the basis of its typology, altitude and location. This pavement is made of rectangular slabs of trachyte from the Euganean hills, between 1,18 and 1,80 metres long and between 0,70 and 0,78 metres large, with average thickness of metres 0,15. 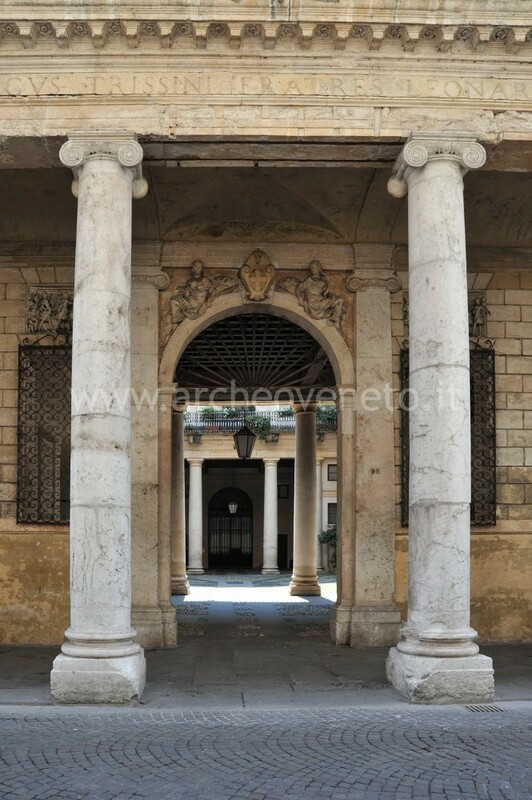 The orientation of the slabs on their longer side is almost perpendicular to that of the street “Corso Palladio”, which runs on the previous “decumanus maximus” of the Roman city. The archaeological remains in this area seem to suggest that the internal organization of the forum of Vicenza implied a clear distinction between the religious and civil side of the town, which were separated by the “decumanus”. What we can see today is supposed to belong to the civil side of the forum, whereas on the north of Corso Palladio the discoveries refer to the sacred area. The piece of pavement that we see today was later cut by a deep hole and by the northern foundations of a tower house which has been dated to the XI-XII century A.D.
Rigoni M. 1998, Vicenza, in Tesori della Postumia. Archeologia e storia intorno a una grande strada romana alle radici dell’Europa, Catalogo della mostra (Cremona 4-4/26-7 1998), Milano, pp. 463. Bonetto J. 2009, Veneto (Archeologia delle Regioni d'Italia), Roma, pp. 465.